IT USED TO BE the building where the Daily Mirror was produced, now it's well underway to becoming a futuristic new leisure complex - and while the work proceeds, huge "comic-book-style newspages provide information. The Printworks will have a 20 screen "megaplex" cinema , restaurants, bars, shops and music venues. Personally, I'm looking forward to the giant Imax screen, with 450 seats. I've visited the Imax screen at the excellent National Museum for Film, Photography and Television, in Bradford. A huge image is projected onto a screen several storeys high, filling your whole field of vision. And it's even more stunning in stereo vision, which I'm experimenting with for Eyewitness in Manchester. The Printworks complex, by Richardson Developments, is being built at a cost of �m, and will be open 24 hours a day. But the Printworks isn't the only hyper-sized entertainment complex under construction in Manchester. The Great Northern Warehouse Experience, next to GMEX, will be another star attraction of the new city centre. Picture of the construction work coming soon! NINETY ONE PERCENT of residents in the Benchill and Sharston areas of Wythenshawe have voted to transfer control to the Willow Park Housing Trust next April. This will release cash for a �m five year programme of improvement to their homes and the district. The Town Hall are unable to spend more because of stricts budget limits. Most residents are very pleased at the news, though a few think that this marks the end of a dream: 70 years ago Manchester Corporation conceived a bold plan to move Mancunians out of the slums and into a new town with spacious houses and greenery. The end result didn't turn out to be the urban paradise they'd originally dreamt of, though Europe's biggest council estate still has lots of positive points, as many proud residents there will tell you! DALE GRANT, who stabbed "Good Samaritan" Steven Hughes six times during an incident at All Saints, Oxford Road, has been sentenced by judge Mr Justice Michael Sachs to just six years in prison. Grant showed good behaviour while on bail, had no previous convictions, and pleaded manslaughter. But Steven's parents have condemned the leniency of the sentence. "Six years is a joke, it's just 12 months for each wound". As the MEN editorial states, what kind of message is this going to send out to would-be troublemakers? See also the e-mail from EWM reader Steven Burt, who's currently working on an off-shore oil rig off the coast of Thailand - they get to some remote places these Eyewitness readers! IT'S THE HIGH POINT of the summer, when blazing July runs up to sun-soaked August - well that's how we like to remember it from our childhood (I remember 75 was pretty hot, but I spent the summer working as a labourer in an old factory in Ashton!). Actually, last year was very nice indeed, but this year, well, so far, forget it! Some experts reckon that the lacklustre weather is damaging our immune systems - I still haven't quite shaken off my throat infection. Well, many travellers are heading for the sun, though as Kevin Feddy reports in today's MEN, passengers with NW-based Airtours have been delayed, due to an undercarriage problem forcing one of their aircraft to return to Manchester Airport yesterday. I'm heading for Germany next week, by car, but don't worry, Eyewitness will continue with frequent updates. I'm planning Eyewitness reports from Chemnitz, the city that is twinned with Manchester, and Berlin, the city we'd like to be twinned with! 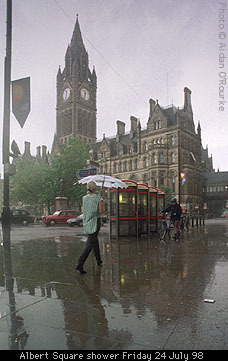 As for the weather, yesterday was the turning point: I got caught in Albert Square during a downpour (picture right), but less than an hour later, the sun was out. Today was supposed to be sunny, but hazy clouds have thickened to the usual overcast grey. Current EWM temperature 63/17. Is that Bridgewater House in the background at Castlefield? I know the George & Dragon in Dubai. It does seem stupid that the city centre does not have sensible opening hours. It might also stop the violence. Perhaps the punishments in the Middle East might help stop would-be idiots. One question why is the text so short these days? PS Do you have any snaps of Didsbury or Bollington nr Macc? I'm doing two, three or four updates per week nowadays, so Eyewitness has more text than ever before. I like to keep it concise, but if you'd like more words, let me know. I'm not sure if that's Bridgewater House in the Castlefield picture, and as for Middle East style punishments, hmmm... I wonder what they would have sentenced Dale Grant to in Saudi Arabia... No pics of Bollington - too far out, but will East Didsbury do...? EYEWITNESS IN MANCHESTER IS NOW UPDATED SEVERAL TIMES A WEEK.